These are fuses for the electrical system of a house. Most homes that you see these days have been updated to circuit breakers, so finding fuse boxes becomes less common each year. 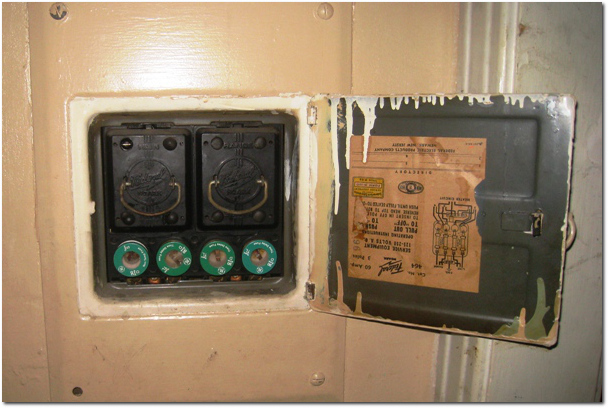 It’s okay to want to buy a house that has fuses, but you should plan for them to be upgraded. Perhaps you’ll be able to convince the seller to deal with them before the closing. That’s unfortunately not always possible though, so just make a mental note as you’re evaluating the property. What are the two black doors above? Don’t know, Brooks. The one on the left is labeled “Main” while the one on the right is labeled “Range” if that helps. I was mostly impressed that they were 30 amp fuses. Normally we see the red and blue ones for the 20A and 15A circuits. I think those two ‘doors’ are fuse blocks — pull-out blocks that hold more fuses, possibly for higher-amp circuits. I had an old townhouse once that had similar stuff, and I had to pull one of the blocks out when I was replacing some outlets. You can see on the (upside-down) wiring diagram on the inside of the open panel door that each one probably holds two long cylindrical fuses. Not sure if the work in parallel with or separately from the smaller round fuses. You’re right, Tom. Zooming in on the schematic in original photo shows cylindrical fuses wired in series with the green fuses. There also seems to be direct connections between the two inner fuses and the two outer fuses. So are those cylindrical ones the “real” fuses? Why have a four pairs instead of just four singles?